Here are the maps and regions detailing the continents within the World of Idalos. Massive and quite expansive, these continents provide the perfect setting for our adventuring needs. The first map explains the different areas of the world and were they are located. 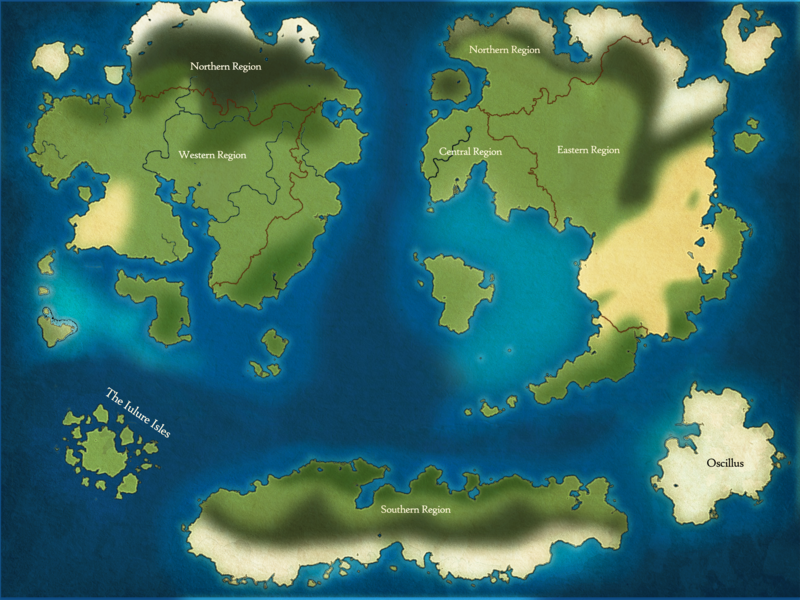 The second map marks where all cities, towns, and villages are within each region. You will see on the second map that every location is marked with a red and white dot. These dots indicate the city or towns name. You'll also see different colors on the map as well. Dark brown colors indicate mountain ranges while the white on top of it are the mountain peaks/ice caps. Light green indicates vast plains while deep green indicates forest or jungle areas. These areas will be labeled so that it's easy to tell them apart. Deep yellow indicates sand. This islands near the top of the map are also white (they may appear yellow at times, this is due to the texture on the map). Travel Times are calculated by your mode of transportation and the route that you’re taking to get there. In some cases, traveling by boat will be faster than traveling on foot. In other cases, traveling on foot will be quicker. Any air travel is done on mounts. Certain cities may have air transportation for your character to use, but this is very rare. Traveling by air is the fast way to travel, however, you must consider your mounts necessities: They need to rest. Depending on what your mount is will affect how quickly you move from one place to another. It is assumed that your character will be traveling on one of the trade routes unless specified otherwise. If you are interested in traveling between cities, please visit the Travel Times document to find out how many days it will take your character to get to that city. If you wish to travel to a place not listed on the trade routes map, please post in the Prophet Support Forum with your thread titled 'Custom Travel' and the details of where you'd like your character to go. A Prophet will assist you with figuring out how much time it will take your character to get there.